Sometimes electronic gadget just like Smartphone will be dangerous if you don’t handle with care. There are many instances happened which we have been reading reports about to suddenly blasting the Smartphone battery. Today we have to discuss how to take precaution to avoid Smartphone battery exploding. It’s over responsibility to take care of our electronic gadgets. If, we don’t take it seriously then we have to face lot of problems. Lot of time we have been reading in different reports about Smartphone battery exploding. What is the reason due to which these things happen again and again and how to take precaution to avoid Smartphone battery exploding problem. This article will help you to reduce these type of incidents which is harmful for us or our family members. There are lot of things due to which these kinds of situation arise in front of you. So, we have to share few reasons why this situation arise along with few precautions to avoid Smartphone battery exploding. Most of the person like to buy cheap handset due to save the money. But do you know there are lot of local parts used in these cheap Smartphone. Due to which most of the time these Smartphone will be blast. If, you want to keep safe then you must have to buy branded company Smartphone at the place of local company smartphone. It the best precaution to avoid smartphone battery exploding. Most of the time when our original phone battery is no more than we have to use local battery in our Smartphone. Many times you feel that your phone is heated too much and lot of time your phone battery in not charging properly but generate lot of heat. All these things indicate to immediately replace local battery with branded battery. Local battery plays an important role for these incidents, so always remember use branded battery in your phone. 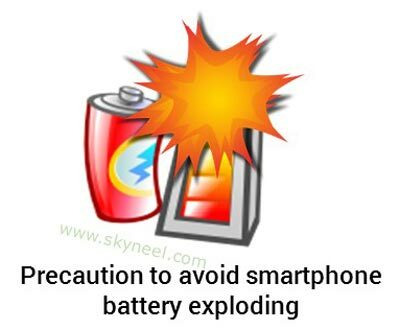 It is another precaution to avoid Smartphone battery exploding. Lot of time we here Smartphone battery is blast during the charging. What is the main cause regarding this exploding? The answer of this question is high voltage. Lot of time due to high voltage your Smartphone battery is not able to consume lot of power due to which it will be blast. So, always take care about your phone and immediately remove the charging socket when you feel high voltage in your office or at home. High temperature is one of the most reason due to which smartphone battery will be explode. Lot of person forgot and put his phone in full sunlight or high temperature room. You must put your Smartphone in the normal temperature it is another best precaution to avoid Smartphone battery exploding. We have to know extensive temperatures effect the Smartphone batteries too much. Most of the person like to use Smartphone too close either in his ear or his mouth. Most of the time we have to listen during talking to someone phones exploded and damage the ears. Sometime when you put your phone too much close to your mouth as per regular habit, due to which mouth cancer and tumours problem arise in our body. We have also faced migraine, headache, weakness in our finger and other problem. So always keep the distance of your Smartphone from your body. You may have to use earphone or Bluetooth for your Smartphone during talking to someone. In the rainy season most of the time our Smartphone will be wet. Water goes inside the Smartphone cover. Most of the person don’t take it seriously they try to remove water from the outer part of the Smartphone and also try to use hair dryer to dry wet phone. Lot of time your phone will be damage properly due to put lot of pressure on different parts of your Smartphone. Lot of circuits are blast during that process. So, avoid to use hair dryer to dry wet phone. You can also read this article how to fix water damaged smartphone. Charger also plays an important role to keep safe of our Smartphone. Lot of person try to save his money during buying charger for his Smartphone. There are lot of local company charger available in the market which is cheap in the cost. But these chargers must be harmful for us, these chargers not able to proper charge the Smartphone battery but also main cause of exploding. You must have to use original company charger during the charging your Smartphone. It is the best precaution to avoid Smartphone battery exploding. Most of the time we have to feel our phone will be heated too much. In that situation if you continuously use your Smartphone for talking to someone or plugin for charging. The overheated device have lot of pressure and it will be harmful for us. Most of the time either different part of your Smartphone will be melt or your phone will be explode. So, always remember during overheated phone there is no need to use them or put near the body. Lot of person forgot during charging his phone. Most of the time your phone battery is overcharging. Always keep in your mind when your phone battery reach near to full charge immediately remove your phone from charging. Most of the time your phone battery will be damaged during that situation. If we have any electronic equipment then it our responsibility to take care otherwise we have to face lot of problem. I hope after reading this article you will be able to take precaution to avoid Smartphone battery exploding. If you face another type of situation or like these points then write your important suggestion in the comment box. Thanks to all.